This chapter deals with general information about Niue, like where it is located relative to other Pacific islands, and the size and shape of its territory covered by its EEZ. This chapter also delves into Niue's long past, speculating about when it was created and what happened to it since. Today Niue is a coral rock on top of an undersea volcano with properties not easily found elsewhere in the world. It is surrounded by a deep ocean for its entire Exclusive Economic Zone, with the exception of Beveridge Reef which may well be unique. The calcite rocks that cover the entire island have weathered to form tropical soils, and they show that tropical cyclones have always been plaguing Niue. Niue's ocean area: the ocean is defined by Niue's EEZ. 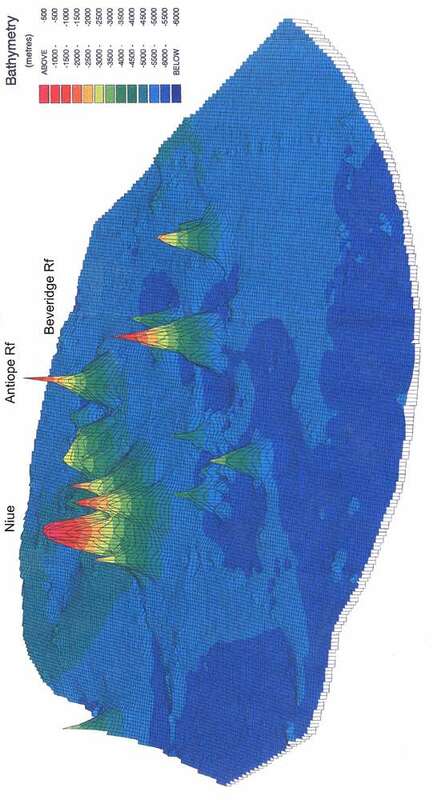 Bathymetry: recent satelllite depth measurements reveal the shape of its deep ocean bottom. Bathymetry map: a larger version of the two-dimensional map shown on this page. 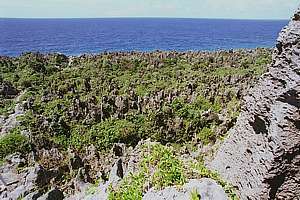 Soil: the soils in Niue were formed from limestone rock. How did it happen? Water: rain water does not stay on or near the surface but percolates down the porous limestone rock, but where does it end up? Niue is a very small island, located NE of New Zealand, East of Tonga, West of the Cook Islands and South of Samoa. The map shows Niue in the central Pacific, and its Exclusive Economic Zone (EEZ) in yellow. Niue is rather unique in being only an isolated island rather than an archipelago. This uniqueness has its influence on the marine life found along Niue's coasts, as it lacks an interconnected 'network' of places to live. The larvae of marine species are thus easily lost in the blue sea, as they drift off into an environment lacking planktonic food. Niue's isolation has also had its effect on Niue's history, culture and wellbeing. To obtain a sense of distance, the map shows a grid spaced by 10 degrees. As the meridians (N-S) are of same size ans the parallels (EW), the grid consists of almost perfect squares. Each square measures 10x10 degrees and each degree is 60 nautical miles (nM), or 60 x 1.85km = 111km. Each square thus measures roughly 1100x1100 km. Memorise Niue's position on the world map so you can locate it on other world maps used in this section. Niue's position is 19 degrees South by 170 degrees West, or ten degrees East of the date line. Niue is located on the Pacific sea plate, coloured here in blue. 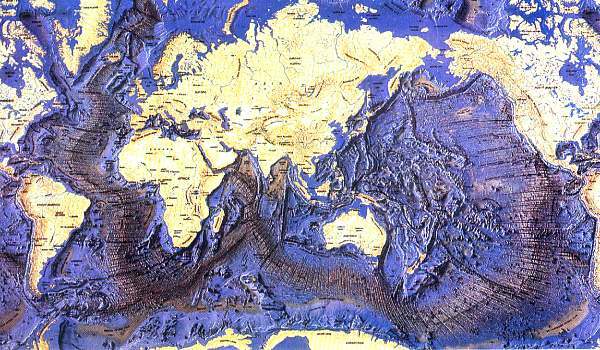 The world's surface area consists of several sea plates and continents. These are not static, but move slowly (drift) relative to one another. The Pacific Plate moves steadily at about 1cm per year in a NW direction. That may not seem much, but when Niue was still an active volcano, peeping its top above the sea, some 2-3 million years ago, Niue was located some 2 million cm further South-East (20km). Located just East of the deep Kermadec Trench, Niue is moving slowly towards this trench and in hundreds of millions of years in the future, will be swallowed up by the Kermadec Trench and pushed underneath the Indian-Australian plate. However, this is of no concern today. It does explain, however, why so few islands exist East of the Kermadec Trench, which leaves Niue rather alone by itself. 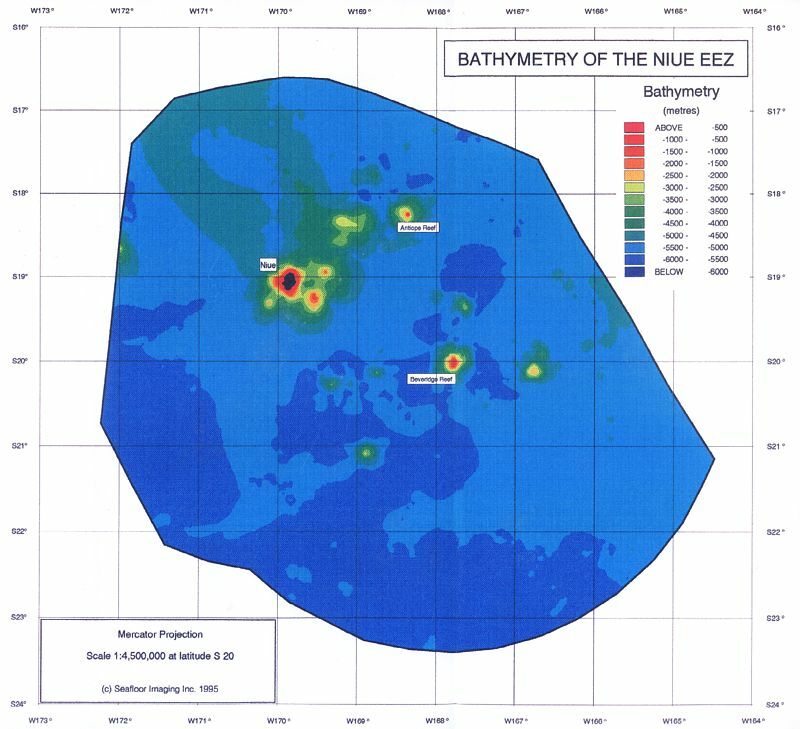 Niue's ocean territory has recently been defined by its Exclusive Economic Zone, an ocean territory encircling every outcrop of land. As Niue has only two submerging parts (Niue and Beveridge Reef), these form the centres of two circles of 200nM (370km) radius, covering a total area of 390,000km2, and extending from W164º to W172º30' and S16º30' ro S23º30'. Where these circles interfere with those of other nations, the sea is divided between competing nations. In this manner Niue borders the EEZ of Fiji in the West, American Samoa in the North and Cook Islands in the East. Its southern boundary is uncontested, bordering international waters. Notice that the grid marks degrees of latitude and longitude, which so near the equator are almost equal, measuring squares of 60nM (= 111km). 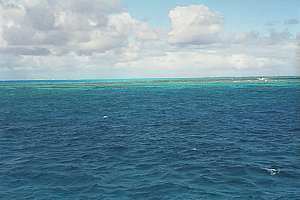 Beveridge Reef lies about 130nM from Niue. Harans Reef (21º32'S, 168º54'W was reported in 1848 by Mr Harans of the ship Thomas Dickenson. The reef was passed at night and the sea broke heavily over it, apparently for about 2 ship's lengths. Its position is now doubtful but new maps show a sea mount over 1000m deep where it was reported. Mr Harans could have seen volcanic gases breaking the surface. Another reef, the existence of which is doubtful, was reported in 1965 to lie in position 21º43'S, 167º45'W, 60nM E of Harans Reef (Pacific Islands Pilot, 1984). This reef is now a myth. As reported by W J Gleeson of the Odyssey in July 1996, Beveridge Reef only barely extends above water, offering shelter to boats who can negotiate its 7m shallow entrance sill. The reef is rather large, about 5 x 4 nM or 9.5 x 7.5 km, about half the length and width of Niue and one quarter its area. As it is also subjected to the SE trade winds and swells, best anchorage is towards the wreck of a 27m (90FT) trawler on a course of 110º Magnetic. On this course, coral bommies leave about 6m of water above them. This anchorage provides best shelter against the SE trade winds. A good dive spot is reported just south of the entrance at the eye of the anchor symbol. Please note that this is a hand-drawn chart, not suitable for navigation, but its GPS co-ordinates are more reliable than those on present nautical charts. Click on the map for a larger version. A latest report (2004) mentions that the trawler wreck has become invisible. 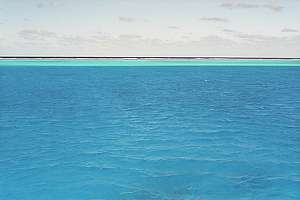 Unlike Niue, Beveridge Reef does not emerge like a raised atoll. Its rim and lagoon are still being built by coral organisms that need to stay submerged in order to grow. This suggests that Beveridge Reef is rather young, from after the last ice age, as the waters rose to what they are now, some 14,000 years ago. bevr07t: the rim of the Beveridge lagoon comes to high tide level as waves outside break over it. Inside the lagoon, the water looks milky due to the white sand below at 11m depth. Photo: Greg Gibbs. bevr10t: Outside the reef, the sea drops off steeply into a giddying blue sea at the entrance to the lagoon. Photo: Greg Gibbs FV SAVANNAH. In 1978, an experimental satellite was launched to study the oceans. One of Seasat's instruments was a radar altimeter, able to measure the ocean's surface from an altitude about 500 miles up, with a precision of 5-10 cm. Surprisingly, the surface of the ocean proved to be curving and dipping, often by as much as 10m up and down (for 5000m bottom relief). When mapped, the dips corresponded to dips in the sea floor and the bumps to sea mounts and ridges. The precision of the measurements allowed computers to make precise and detailed maps of the entire world's ocean floors. The above map shows the world's ocean sea floor. The broad bands with parallel lines is where the ocean floor spreads, and where new ocean floor is created. The thick black lines are the deep ocean trenches where ocean floor is subducted, disappearing underneath some other ocean plate or continent. Along these trenches one finds the world's active volcanoes or 'rings of fire'. 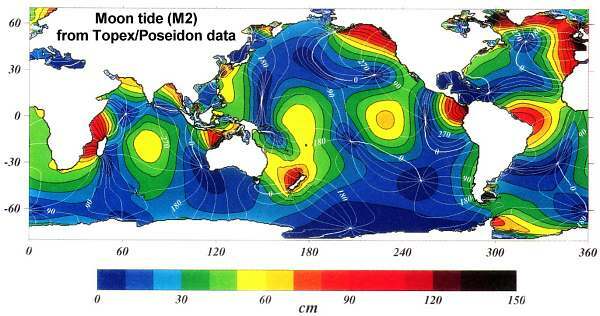 To be more precise, disturbances of the gravity field created by non-homogenous mass distribution within Earth cause deformations of the sea-surface. These sea-surface deformations are measured by satellite altimeters on board oceanographic satellites. The short wavelength variations (20-250km) of the geopotential anomalies (or sea-surface anomalies) are strongly correlated with the seafloor topography, because the latter is the shallowest interface which produces geopotential perturbations at the surface of the oceans. Satellite altimeter data was obtained from SEASAT, GEOSAT (Exact Repeat Mission), ERS-1, TOPEX/POSEIDON. 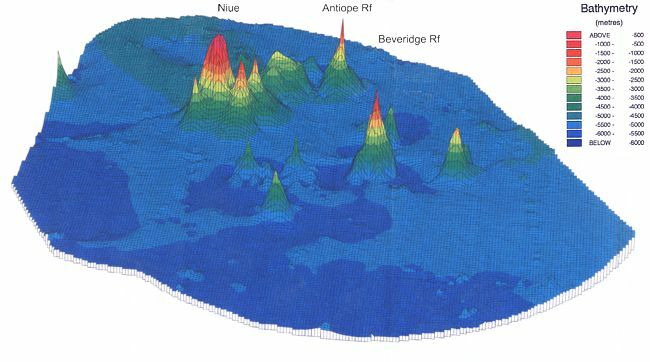 The accuracy of the seafloor computed depth is better than 10% of the mean seafloor depth (better than 500m for Niue EEZ), and the horizontal resolution is about 5 km. But the satellites, in their rather precise orbits, have not crossed over every bit of ocean, leaving gaps between their tracks. The abyssal seafloor is made up of lower Cretaceous oceanic crust (100-140Mya) with depths between 5000-5500m. Volcanic activity has created two groups of sea mounts, one with Niue and the other with Beveridge Reef. Only seamounts 1 and 2 had been reported previously. Niue is an old and inactive volcano that rose above the sea before it died. As its soft cone eroded by weather and waves, it also shrank as its core cooled. During this slow process, a coral reef formed on its top, the Mutalau Reef, named after the island's present highest point. The reef kept up with the sinking rate of the volcano, laying down a coral cap of possibly 70 + 130m = 200m. The diagram on right aims to visualise what happened, but hard scientific information is not yet available. Because of the Pliocene-Pleistocene fossils found in what was then the atoll's lagoon, the limestone cap must have formed before the severe ice ages of the Pleistocene (1.6 million years ago to 10,000 years ago). No tertiary fossils were found (56 million to 2 million years ago). During the long period of the great ice ages in the Pleistocene, the sea level rose and fell while the world's climate was cooler by several degrees. It is not likely that much coral formed during that cold period. The Alofi Terrace may have formed during the penultimate interglacial, some 150,000 years ago when sea level stood 25-50m higher than today. In the meantime the interior developed its soils, which today are much more advanced than those on the younger Alofi terrace. During the last ice age, the sea level fell by 70-110m and as it rose at the end of this period, some 10,000 years ago, it laid down more coral reef and eventually the 'wave-cut' terraces of today. Ironically, the sea level did not rise to the Alofi Terrace, as in New Zealand the present dunes are overlaying ancient dunes. This is perhaps due to Niue still rising slowly. At present, sea levels around New Zealand appear to be rising by 30cm in a century, a rate that corals can keep up with at present high temperatures. The coralline flats surrounding the island at low tide mark, suggest that Niue is also rising at this rate, for if this were not so, the flats would have been dry at all times. Please note that the name Alofi Terrace refers to the 20-30m high terrace surrounding the entire island, and not just the terrace found at Alofi. Likewise the Mutalau Lagoon refers to the entire inland basin, and the Mutalau Reef is the entire high ridge around the island. The diagram on right shows tropical sea temperatures (red) and mean sea levels (blue) for the past 300,000 years. Plaeontologists distinguish four ice ages: Wuerm, Riss, Mindel and Gunz with warm interglacial periods in between (Sicilian, Milazzian, Tyrrhenian, Monasterian and recent Flandrian). During all of this time, Niue was located at the southern fringe of where coral grows faster than erosion by wave action and natural dissolution of limestone in water. Follow the red curve for all the periods extending above 26-27ºC. 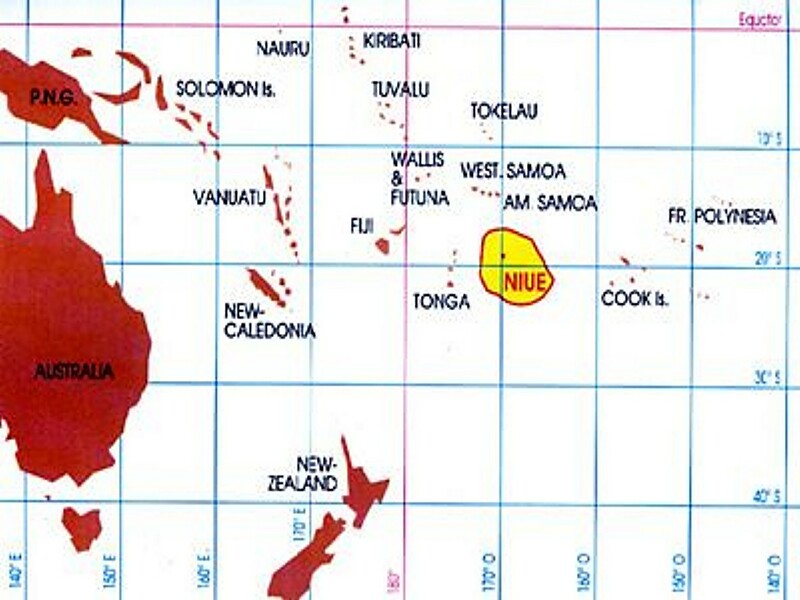 During these periods, Niue grew, whereas during the inbetween periods, Niue must have shrunk due to insufficient coral growth (the higher the temperature, the better corals grow). Follow the blue curve, and it shows that some 250,000 years ago, the sea level stood 100m higher. Further back in time, it stood higher still. Thus the Mutalau Reef and lagoon may have been formed during warm times when the sea level stood 100m higher than today. Fossil shells show that this happened some 1 million years ago but this date is uncertain. 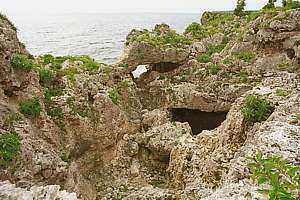 Niue may have formed in the Sicilian interglacial when the sea level stood above the Mutalau Reef. The Alofi Terraces may have formed in the Milazzian and Tyrrhenian warm interglacials (120,000 - 170,000 years ago) and another accretion may have happened some 80,000 years ago. These successive periods of accretion and erosion may have caused discontinuities in the Alofi Terraces with alternations of weak and strong rock, resulting in chasms seen today, explained by geologists as faults. Please note that sea levels are difficult to determine, due to continents sinking under the load of glaciers, and rising again in warm periods. Zeuner F E (1959): The Pleistocene Period. London. The shoreline of Niue is remarkably alike, all around the island but it assumes different shapes depending on wave exposure (the wild side) and damage from hurricanes (the sheltered Alofi side). In the chapter about the island's ecology,we'll come back on this. This diagram shows the general cross section of the shore line. From right to left, one leaves the ancient Mutalau Lagoon of 30-40m height, crossing the ancient Mutalau Reef of 45-75m to descend onto the Alofi Terrace of 20-27m height. Descending over one of the ridges, one comes to a steep dropoff of 6-20m height, undercut by a wave-cut notch of several metres high. Going down a heel of 0.5-2.5m, one arrives at the coralline flat which is bordered by a slightly higher fringing reef. Underneath the coralline flats extends a maze of caves, at times opening up into blow holes and seething canyons. At about 6-12m the rubble collects onto sandy flats, alternated by coral-clad ridges, leading down a gentle slope to 25-30m depth where the slope becomes steeper, the deep reef with corals able to live in diminished light, while unaffected by storm waves. There exists a remarkable difference between the exposed SE coast and the sheltered but hurricane-torn NW coast. 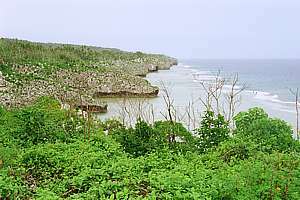 This view, looking south from Tuapa (N of Alofi), shows the typical shape of Niue's shoreline. From the sloping Alofi Terrace on left, ridges run into the sea, alternated by steep valleys. Both end in a platform that extends further out into sea before it rises into a knee-high ridge, the outer reef. From there it drops down to 6-10m, where it descends more gradually. In their reports, geologists speak of wave-cut platforms, but we disagree. These platforms were formed in recent times, mainly by the growth of coralline algae, with here and there a true coral of the types able to suffer fresh water immersion and exposure to air (Porites and Acropora species). The flats are entirely flat and horizontal as low tide is the decisive limitation for growth. Underneath one finds extensive cave systems. The wave-cut notch is caused by wave erosion but where sea life persists, there exists a ledge or heel, the erosion of which is slowed down considerably by encrusting marine life. Soil is the precious substance that allows plants to grow, and grazing on them, the animals. Normally soil is formed from hard rock such as basalt, granite and volcanic debris. These rocks were formed under high temperatures and pressure, and they very slowly decompose (weathering) in atmospheric pressure, particularly under the influence of moisture and acids. Plants retain moisture while providing for acids from their decomposing tissues (leaves, stems, roots). So the development of soils goes hand in hand with the flora growing on and in it. 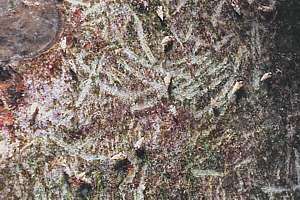 With it develops the soil fauna, often unique to a particular location. But how does this happen in limestone? coralline rock: although corals are the highly visible structures on a coral reef, the coralline algae that grow like a paste or paint, layer upon layer, leaf upon leaf, make up the bulk of the reef structure. It is in fact seldom seen that a new coral grows on an older or dead one. First the coralline algae form a new base upon which new corals then settle. 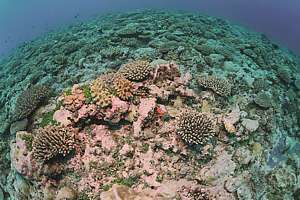 The coast facing hurricanes has very few corals and rocks here are mainly formed by pink paint, at times enclosing broken fragments or coral debris. Pink paint is a porous rock, diffused by plant tissue. When it dies, this tissue or the nutrients from it, remain inside the rock. When it weathers under soil, which is easy because it is not very hard, the nutrients are freed up. This suggests that the soils from coralline rock form more readily and that they are somewhat more fertile, but there is no scientific proof of this. coral rock: in warmer seas, the hard corals make up a large part of the rock, although they may end up as debris washed up on a beach or piled up against a coral cay. In Niue all corals are encased in pink paint, but the side facing the trade winds has rock containing more hard corals. Hard corals contain animal tissue in relatively large pores inside. when corals die back or 'bleach', they lose (or re-use) the animal tissue. As a result, they contain hard limestone but with fewer nutrients. Again, this has not been proved scientifically. coral sand or cemented coral sand: inside the Mutalau Lagoon or the central basin of Niue, one finds much limestone formed from coral sand. When such limestone has been percolated through from layers above it, it may become cemented and hard like dripstones in a cave. Coral sand can originate from coral debris being ground up by wave action, but most originates from grazing fish, particularly parrotfish, scraping soft coralline rock and passing it through their digestive systems physically unchanged but with less algal tissue inside. 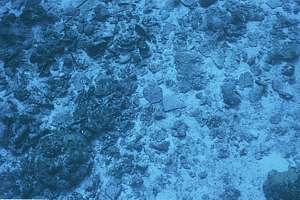 Where substantial shelves (like continental shelves) exist around reefs, the sand may be retained on sandy flats and beaches but Niue loses most of it down the steep slope into the deep sea around it. As soil develops from the base limestone rock, it loses (eluviates) minerals that are not needed by plants and soil animals (including fungi and bacteria), while retaining and accumulating those it needs. As can be seen from the soil table below, rarer elements like aluminium, iron and titanium are accumulated whereas the common unused minerals calcium and magnesium are lost. Note that the aluminium and iron compounds are not used by plants and animals but they form what looks like soil, the substance able to retain nutrients, and for plants and soil animals to live in and on. The soils in Niue are not lost by erosion, sheet-wash and transportation in rivers towards the sea. Niue has no rivers but rain water disappears through the many fissures, tunnels, channels and cavities in the coral rock. With it, soil also disappears into the limestone rock rather than remaining on top. So, trees with deep roots can reach it and the moisture it contains, whereas crops cannot. As a result, agriculture on Niue is susceptible to drought even though rainfall is double (2100mm) that of Auckland (1100mm), New Zealand. Limestone is dissolved by the small amount of carbondioxide that dissolves in water. The air around us contains very small concentrations of carbondioxide, only 40 molecules for every million. Those molecules that dissolve into water, exist in equilibrium (balance) with those outside, such that the concentration of the acid it forms, is indeed very low. But this small amount attacks limestone rock fiercely, dissolving it into the water. In this manner the other elements in the rock are freed up, enabling the formation of soil where plants and soil biota (worms, bacteria, fungi) exist. 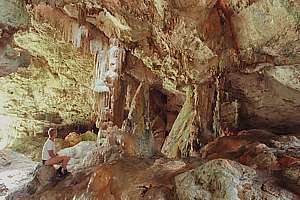 Where the infused water (with calcium in it) dries up, such as on dripstone formations, the limestone is again laid down layer by layer, in a very hard form. Where algae are present due to available light, such dripstones may assume wonderful palettes of colour, such as in the Avaiki cave. f044711: this coral seascape is the best Niue can offer, located on the wild side of the island. 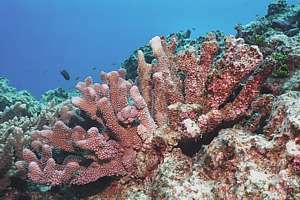 It is rich in coral 'shrubs' but notice also the amount of empty space inbetween, covered by coralline algae (pink paint), which grows over old corals, creating the substrate for new ones. f044920: a pink branching coral is slowly dying from right to left and already its rightmost branches have completely been grown over by pink paint. Gradual die-back and recolonisation by coralline algae appears to be normal. f043705: scratch marks from grazing fish. In scraping nutricious algae from the rock, they unintentionally also scrape off some rock, which becomes sand after passing their guts. f043927: off Alofi and Avatele one finds flat areas and gulleys filled with coral sand and rubble. This photo was taken with a 28mm lens, looking down some 10 metres. Geologists have distinguished three kinds of limestone: reef rock, beach conglomerate and cemented or loose coral sand. The most striking character of the reef rock is its low content of macroscopic (visible) coral fragments, which are entirely absent from some exposures. This indicates that these reefs were built by coralline algae rather than coral. The middle of the island was once the atoll's lagoon, and it is still mainly flat today. The surface rocks of the basin are all calcarenites and commonly contain mollusc shells. The sand is cemented on about 60% of the area and incipient (beginning) karrenfelds have developed leaving residual pinnacles commonly rising about 5ft above the adjacent, flat, uncemented sand. On the outer side, reef rock is exposed in the steep bluffs down to the younger Alofi Terrace. It consists of fine to coarse, cemented, unbedded sand containing rare coral fragment, most being found in the south. The rock on the margins and the highest remnants was carefully examined across eight sections and was found to be reef rock similar to that on the outer slopes. No beach conglomerate or cemented beach sand was seen. The photo shows typical limestone formations at Alofi on the hurricane side of the island. The southern coast is attacked by the full force of the prevailing winds, and the effect of constant spray has produced an entirely different landscape from that in the more sheltered coastal areas. Instead of it being cliffed, it is backed by a slope of 17-22º leading from sea level to the Alofi Terrace. This slope is bare of vegetation and is exceedingly rough, being a karrenfeld of crevices and razor-sharp pinnacles. Blowholes add beauty to this desolate coastline. From our observations, and supported by Schofield's observations on the differences in limestone between the exposed and sheltered coasts, we propose (hypothesise) that the limestone on the sheltered Alofi side was shaped by the influence of hurricanes. Underwater we see extensive barrens from which coral colonies are repeatedly being removed by hurricanes, and their place taken by soft algae growing on hard coralline algae. This process must have been ongoing for as long as Niue has existed. As a result, the limestone rock on the hurricane side are as erratic and jumbled as we also see under water, whereas the rocks on the exposed side show more structure. karren= (German: karren=cart, referring to their wheel tracks; feld= field) the furrows or runnels that occur from solution by rain wash on limestone in karst areas. They range in width from a few millimetres to more than a metre, and are commonly separated by sharp ridges. karst= (German: Karst is a region in Germany) a type of topography (landscape) formed over limestone, dolomite or gypsum by dissolution. It is characterised by sinkholes, caves and underground drainage. calcarenite= a limestone, more than half of which consists of cemented sand-sized grains of calcium carbonate; a consolidated calcareous sand. Note that coral sand is produced mainly by the many coral-scraping fish like parrotfish. Inside a sheltered lagoon, such sand would over time, build up, forming a habitat of its own with sand-burrowing clams. But on the outside of the reef, the sand plays a lesser role as it can be lost to the abyss. phonolite= a group of fine-grained extrusive (volcanic) rocks primarily composed of alkali feldspar & mafic (dark ferro-magnesium) minerals. fault= a fracture or fracture zone along which there has been displacement of the sides relative to one another parallel to the fracture.
? ?O3 2.43 .. 0.3 0.52 ? This table indicates that the soils of Niue are considerably richer in aluminium, iron, titanium and phospate than the underlying limestone. This is a part of the evidence advanced by Wright  to support the hypothesis that basic volcanic ash has contributed extensively to the soil materials of Niue. He notes in particular that Al2O3/P2O3 of the soil is more than double that of the limestone. The ratios expressed in the analyses of the Niue soils are reasonably close to combined Al2O3/Fe2O3 ratios of basalt and phonolite, which are common in igneous rocks in the Pacific. However, the way soils form from rock or limestone is governed by plants and soil biota. All useful minerals in the right ratios will eventually circulate between soil organisms and plants. When 20m of rock decomposes into 0.5m of soil, there has been ample opportunity for the soil to retain and accumulate all the minerals it needs while leaching those that are in excess. There is no need for volcanic ash to explain the observed mineral enrichment. Note that Alofi Terrace soils, being much younger, have high calcium content and low iron/aluminum content. For more information, read the extensive Soil section on the seafriends web site. And the abundance table of elements in the solar system, soil and living organisms. Wright, A C S (1960? ): Soils and agriculture of Niue Island. NZ Soil Bur Bull. Niue is located south of the tropical rain band but north of the desert band around the world. Rain falls reliably in winter, between July and December, but becomes erratic outside this period, resulting in unpredictable droughts that have on occasion, destroyed crops (see history). Although total rainfall is nearly twice as much as in auckland, New Zealand, it all quickly soakes down into the porous coral rock. But some 1-3m above sea level, the fresh water collects in a labyrinth of channels and pores in the coral rock, in what is known as a water lens. The diagram shows the possible shape of it. As the formulas show, for every one metre above sea level, it must extend 37m down into the salt water. Experiments done at the Fonuakula well showed that the water stands between 1.8 and 3m above sea level. The well is pumped to supply fresh water to important places like the hospital, but it cannot be overdone. In theory this water lens could be tapped from the central basin to supply water for agriculture, but this has not been investigated carefully enough as agriculture needs a considerable amount of water, far more than that needed for washing and flushing toilets, and the voulme of the water lens may not be enough. A dug well at Fonuakula is 54.3m deep, supplying water to the Tufukia hospital near Alofi. Its shaft is 1.5x1.2m wide, bored through the massive limestone. It can sustain 400 gallons/hr (1800 l/h). At 2m of rainfall per year, the input to the water lens is 500 billion litres or 500 million cubic metres (5.0E11). The water lens consists mainly of limestone with small pores. Assuming an average depth of 50m, and a limestone porosity of 1%, the water lens may contain some 120 billion litres (120 million cubic metres) of fresh water. Obviously, this water lens cannot grow any bigger, and all rain water flows off it to the sea above sea level. It is fascinating to see the many wells of fresh water spouting their contents over the clear sea water after a heavy rainfall. Niue is located south of the moist tropics but north of the dry subtropical deserts. Warm moist air rises above the equatorial band, raining its moisture over tropical rain forests. The dry high altitude air travels south-west in a rotation known as the Hadley Cell. Above the subtropic high, the dry cool air descends and warms up, becoming even dryer. From the subtropic high the wind continues its Hadley spiral, now blowing as a south-easterly trade wind, evaporating moisture from the sea and joining up with the tropics again, where it deposits its load of moisture. This is why Niue experiences long periods of trade winds blowing from the south-east. The tides do not move in the simple textbook way, as a bulge travelling around the Earth (See Oceanography/tides), but in circles running along the continental shores rather than head-on. The map below shows how these circling waves form nodes (dark blue) without any tide and high tide excursions inbetween (yellow to red). The spiderlike web of white lines provides their timing. New Zealand forms an unusual node with high tides and the tide wave encircling it counter-clockwise. It joins up with the dark node east of Niue around which the tide moves clockwise and so on. Niue is located in the green band, experiencing a moon tide of 2 x 45cm= 90 cm. Note that the solar tide adds to this, resulting in a neap tide and a spring tide of less than 1.5m twice each lunar month. In Niue the tide would be inconsequential, except for it flooding the coralline flats. When the tide is out, these flats and their many pools can be visited. Small to medium waves then brush up to the surrounding coralline rim, leaving the flats calm. During high tide and inbetween, however, waves wash over the fringing rim and their returning water assembles in sink holes and canyons, often causing a current too strong to swim against. It all depends on the size of the waves of course. Currents are not of concern in Niue but locals report strong currents flowing around Tepa Point.